Don't have a DSi yet, but gonna pick this up for when I do get it. Plus I could use the SD card right now. I'm stuck witha 256 mb card. June 23? SCORE!! That's my bday, hopefully there's some at the EB Games here. I wonder if these things just work on the DSi, or if they'll work on the DS lite too... im sure they do. I wonder what speed those SD cards are. I had to buy a 60x Sd card for my wii for it to NOT take 10 minutes to copy an N64 game over. BTW, does anyone ever get the feeling capcom is hard up for money? 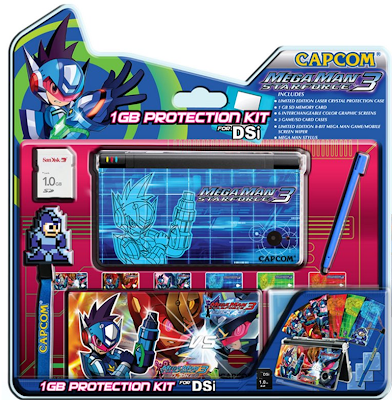 Like with the press kits, where they were selling them for $50 a pop, I mean I can kind of see with Megaman and the SF kits, but that Res Evil kit was a joke. Then there's the resident evil wii blaster on their store which is $10 higher than gamestop's price (how sad is that?) with a description about how rare it is. Are they trying to start their own mini-ebay site? Oh yeah, then of course there is the craptastic Capcom Unity card with it's zillion fees they don't tell you about until you get the card or dig through the FAQ to find them. Just a random question: Why would the Nintendo Ds-Lite Special edition Kit come with a SD card? it does'nt the DSL version comes with no memory card. also the DSL and DSi stuff is NOT compatible. Went to two different gamestops today. They were NOT in stores. Hell, when I went to ask them they said they haven't heard anything about it nor could find anything on it through the computers. It will most likely come out near the game's release. do this works at DSL? Yes, but you'll need the DSL version.